Hi, I'm Kerry and I've set the challenge this week and as it’s coming up to Valentines Day, it just had to be a Valentines card or project. But, I challenged the Design Team to use non-traditional colours, so no pink and red even though a little bit did sneak in. So for this week, I challenge you to do the same. You have until noon on 7th February to enter. Please don't forget that the maximum number of challenges you can enter your card or project into is 10. If you're not sure of the rules for our challenges just take a peek in the sidebar. We'd love to see your creations, so create away. Congratulations! Please email Nikky for further details and your blinkies! Here is what our fab design team have created for the week 4 challenge, some with traditional hearts, flowers and ribbon and some really funny fun ones. This is our last week with our Guest Designer Ruby - thank you for joining us during January - your creations were stunning! She made this wonderful heart shaped card using her own template and printed papers from the Heritage collection from Back to Nature. The heart silver mirri board was run through her Cuttlebug and used alphies! She machine stitched some new lace which was first pleated. 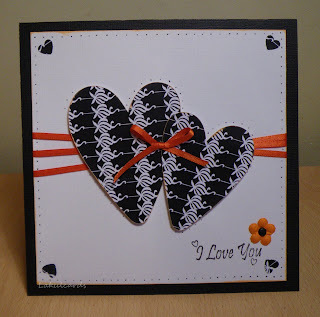 Kerry - I went for orange and black and just one paper from the Candy Doodles CD for the hearts. A touch of ribbon and a prima flower. Brenda - Image and papers from the Elegance section of new Love and Romance CD, main image cut with nesties, inked with versamark and embossed with iridescent powder to glitz it up. Roses made with paper from same collection. Ruth - And that is not red ribbon or card or heart - honest!! I did go with a black and white theme for Kerry's challenge but just could not resist the additional red - sorry! All papers are from Love and Cherish. The red heart is actually an earing! More details are on my blog! Claire - I do sooooo love that Back to nature CD so I went for a fun Valentine with that oh! so cute owl. I used the neopolitan papers from back to nature and the flower patterns from Love and Cherish to create my blooms! Kris: I've chosen to use Back to Nature also. This is my first attempt at using one of the shaped cards and hopefully I haven't been too irreverent! I changed up the horse stable a bit and made a double gate across the front. 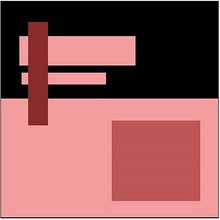 "VALENTINE" is made using one of the printable alphabets and the other words are computer-generated. Dolly: I’ve gone for blue and green, with just a hint of pink, using a mix of CDs. 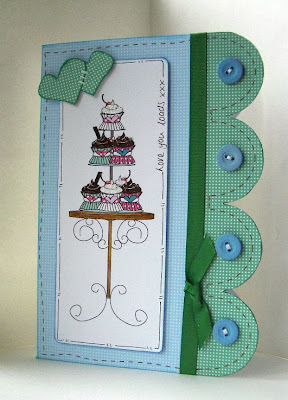 The background papers are from Back To Nature and the cupcake stampie is from Love and Cherish. 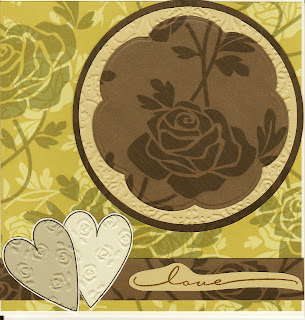 Fliss: I decided to go for rich gold and yummy chocolate brown for my card and have used the gorgeous rose papers and some of the versatile cut out hearts from the latest Love and Cherish CD. I've used a Nestabilities flower shape and some embossing together with a simple stamped greeting for a really elegant look. Nettie: I have opted for the more chilled colours this week, as we are going for Non Traditional colours. 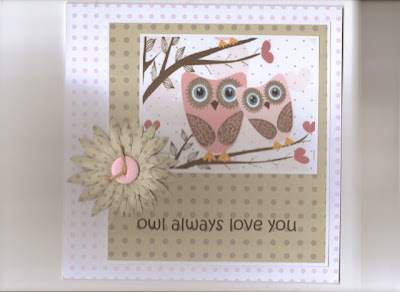 I have used the Back to Nature CD for my papers this week, the patterned paper is from the Hootin Trees collection and I have printed the Alphies onto this paper to spell Valentine. You have until 12noon on Sunday 7 February to enter! Good luck! It's Friday again and time for another Polkadoodle Challenge! The talented Nikky has provided the sketch for this week, so if you want to play along use the sketch below and use Mr Linky to show us your creation! The deadline for entries for this challenge is Sunday 31 January at 12noon GMT and please remember that you can only combine your creation with 9 other challenges. and in first place with a stunning entry is Chris, who says this is her first ever challenge so what an awesome start, she's obviously one to watch! Thanks and congrats to all 3 of you, stunning work and thanks to everyone who entered. Can you 3 girlies please contact Nikky for blinkies and prizes please. If you want to catch Nikky live on TV she has another show on Ideal World and Create & Craft this Monday at 3pm, so make sure you tune in and watch! And now onto the samples from the Design Team! Our Guest Designer for January is Ruby and she has made this stunning easel card and used the digi image from Back To Nature along with the sentiment and flower. 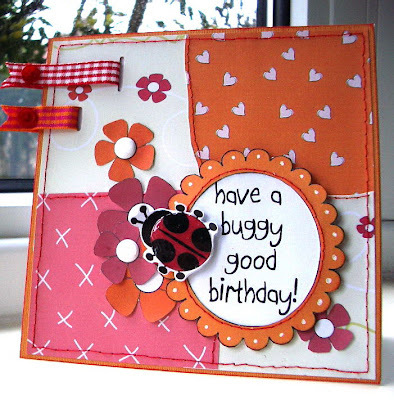 A bit of embossing and it totally transforms the card! Kris: For this sketch with color challenge I've used the red and orange for accent colors. 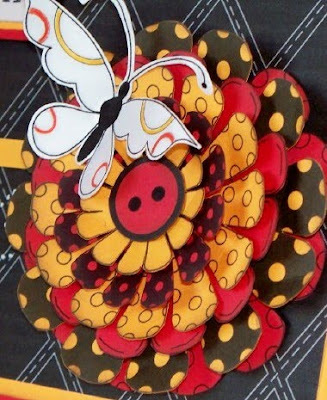 The black harlequin paper is from Jingle Jangle, the butterfly from Candy Doodles, and the stacked flower from Back to Nature (just goes to show how you can put together elements from lots of different CD's). I have a close up of the flower so you can see the dimension with all 7 layers (easy as pie to print the flowers on colored card stock and cut out). Ruth: I've used the stackie flowers from Back to Nature and have layered the biggest one. The petals have been curled to give some definition. Added buttons in the centre of the flowers and then curled some wire. Doodled around the edges of the card and tied some black organza ribbon across the front to finish it off! Lou: I know I always seem to be using these papers but do lurve the Picnic Brights collection from the "Back To Nature" CD. The gift box was made to house my baby sisters birthday present, so it had to be girly but modern(ish)! 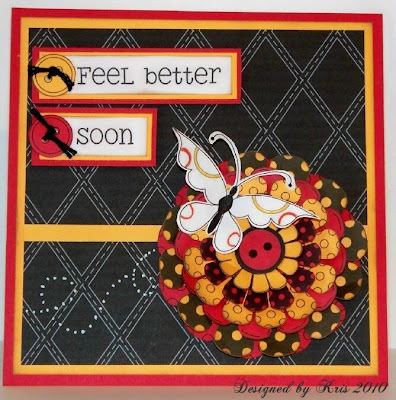 Embellished with spira flowers; stamped with flourish design from Daisy Doodles stamps; wire and gems as added bling! Brenda: Back To Nature cd, image coloured with Copics and panel Cuttlebug daisies folder plus a bit of glitter. Kerry: I turned the sketch around and coloured Polly with brushmarkers and used papers from Candy Doodles. 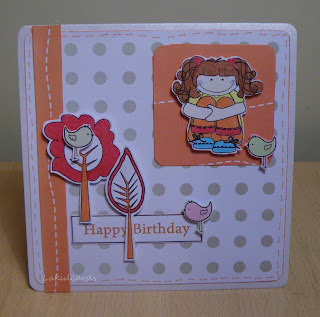 Kate: I have used Sugar Birdies and Candy Doodles cd's for my little birthday card. I have coloured Polly in with Promarkers 'cos I love 'em ! Claire - I have used a right mix of bits and bobs from the Cd's - just goes to show they really do all work well together. Candy doodles, Back to Nature and Jingle Jangles have all been used with some Sakura and a bit of added doodling! Fliss: Everything's coming up daisies with my take on this sketch. I used the pretty daisy paper from the new Love and Cherish cd combined with the flower stackies from the Back to Nature cd. 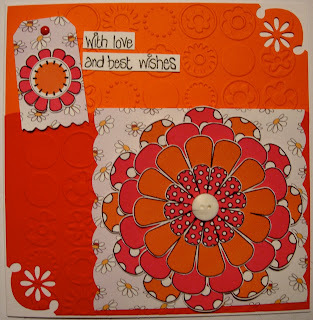 I've done lots of layering using red and orange card embossed with the Cuttlebug Bloom Dots, scallop scissors and a daisy corner punch. Nettie: I really enjoyed making this one. I have used the Not For Girls cd for this card. I really love these cool birds and I coloured mine in with my Promarkers. I have just the person in mind to send it to!! Dolly: All papers and elements from the Sugar Birdies CD. Added some hand stitching to the squares of paper on the base card to create a patchwork effect and glossy accents to Lulu the ladybug to make her shine! Krista I used the Cd Back to Nature. 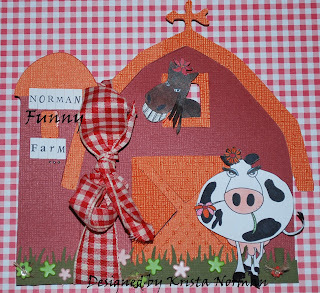 I decided that a barn would go great with these darling animals. I colored the farm animals with my copics. These stamps are awesome to color. Good luck and we can't wait to see what you create! Deadline is Sunday 31 January at 12noon GMT! Well hello doodlers! Seems to have been ages since I posted a challenge, thank goodness for the lovely beaut Doodle Dollies who can take over for me when things get manic! I hope you all like the new format with each of us taking turns to give you a challenge - far more interesting than having me dribbling on each week I'm sure you agree! I can't believe it's only 15th Jan, Crimbo is a dim and distant memory for me but hey, bring on 2010! Well, last week we launched a brand new CD-Rom perfect for this time of year - Love and Cherish - full of romantic, smoochy images, florals, hearts and flourishes and it is flying off the shelves. We're really struggling to keep up with orders on this one and I think it's because it's a really versatile CD. There are a couple of trademark Bird collections in there (of course, lol!) but I've really tried to design these collections so you can use them on a variety of projects - the OH also said I have to tell everyone he thinks they are brilliant for Guys cards as well, so consider yourselves told, lol! If you missed the TV launch of the new CD you can catch us again on the next show which is on Monday 25th Jan at 3pm, on Ideal World and Create and Craft - great for those of you on Freeview as you'll be able to catch the IW show! So this week I challenged the teamies to make, obviously, a LOVE themed card using the new CD, and this is your challenge too. 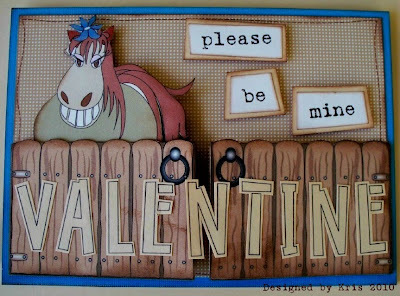 You can use anything you like but it must be Love, Valentines, Anniversary or a Wedding project. You have until Sunday 24th Jan lunchtime to enter this one, so get your romantic heads on and the winner of this challenge will receive a copy of the Love and Cherish CD! "This week I've made a Frame Card with a 13.5 cm square black card, used 'shake a tailfeather' and 'Housey housey' on the inside front which are both from the Back To Nature CD. I've also used sentiments which are all from the BTN cd as well." Krista... "Owlways Love to Read"... I used the Love and Cherish Cd. 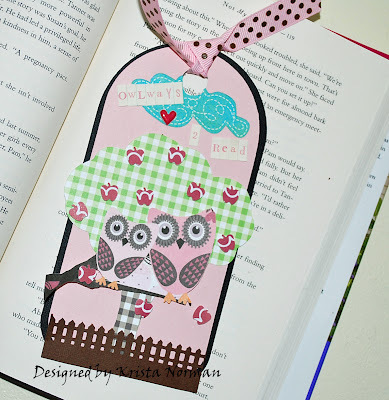 Everybody and Anybody can use a bookmark to mark those special pages. 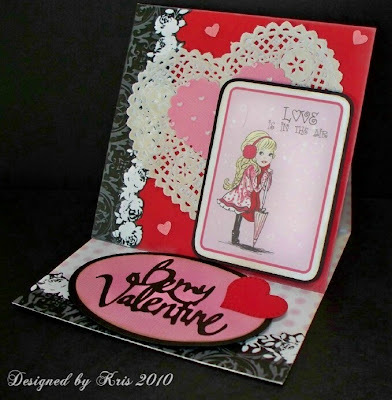 Kris: I just love Nikky's toppers and I've used 2 of them on this easel card. The most darling little girl leaning on her umbrella and then I fussy cut the silver/black/white floral border and used a piece on the top and the bottom. The primary card is made with a pink polka-dotted piece from the new colloection and the rest is just solid cardstock and a paper doily I found in my stash. Lou - I decided to decorate a bag using the mocha papers & toppers from the "Love, Marriage & more" CD to give that special present to the happy couple. I added a dash of exuberance with the large ostrich feather! 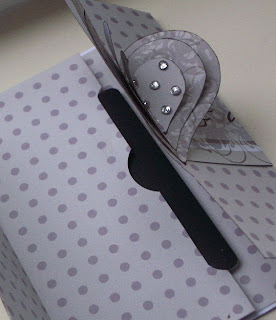 I have also made a matching gift card secured to the handle with ribbon. Ruth: Made using one of the fames and toppers from Love, Marriage and More and some red card. There are 4 photos in the little book which measures approx 3 ins tall and 5 ins wide - so it is little! More photos are on my blog! Fliss: I've used the gorgeous diamond hearts from the embellishments on the Love & Cherish CD combined with some of the papers from the Elegance section and printed out the same fleur de lys paper on red card as well as white (something you can do with quite a lot of the designs for even more variety!). 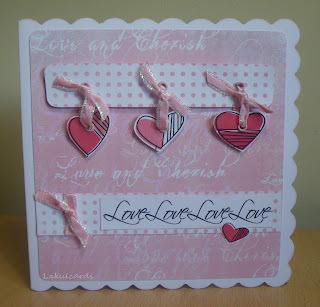 I also made a border strip with the smallest diamond heart-you can find out how on my blog. I layered my large heart for some sparkle and added a key treated with Glossy Accents and a computer generated sentiment. 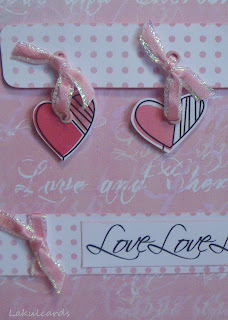 Kerry - These little hanging hearts were made using the set of papers called Heart to Heart. I love the soft pink colour of the papers. 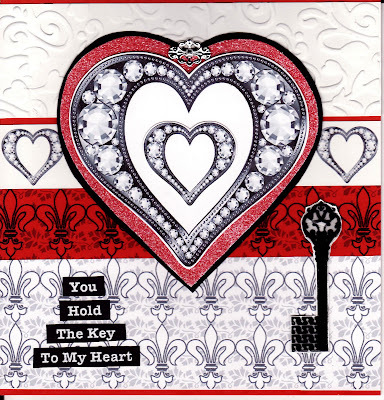 Brenda - I've used the Heart to Heart collection from the new Love Marriage and more CD, it's just fabulous. I made an easel card, laid acetate over the main image adding some ribbon, pearls, brads and used an MS punch to create a border cutting a second layer from acetate to give some dimension. Boni - Made this little heart album out of the Heart to Hearts. The album has eight pages and you can add photos, love quotes and poems or leave as is. Kate...I have used the new "love and Cherish" cd . 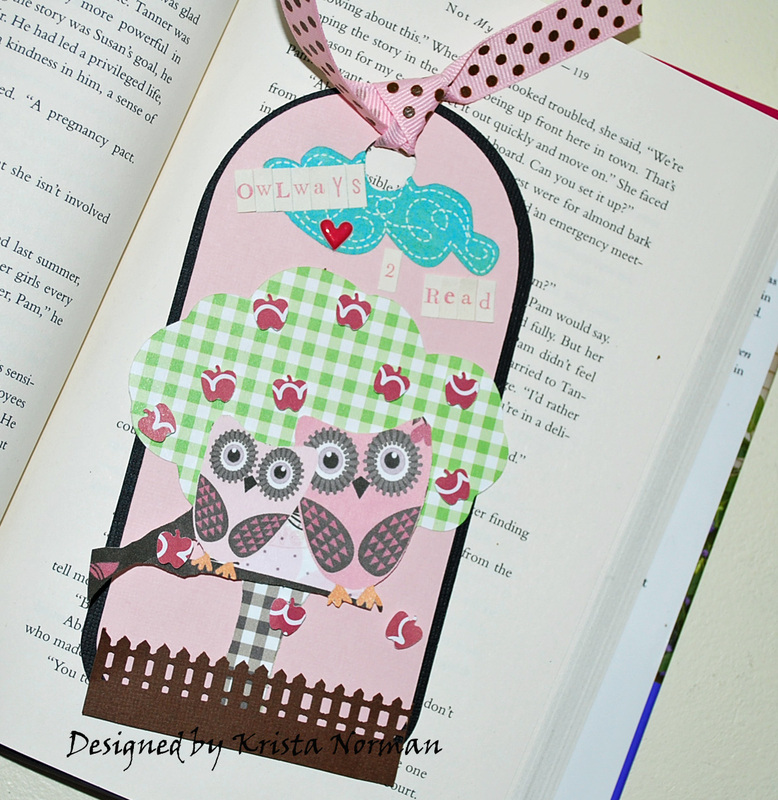 These owls are just so gorgeous i just had to use them . The flower is made using the stackies flowers printed onto the back of my chosen paper and cut out - that way it doesnt matter if you go over the lines when cutting out ! Claire - Having discovered this "Joy" fold, I thought it would look really good used with the moonlight range on the Love and Cherish CD. 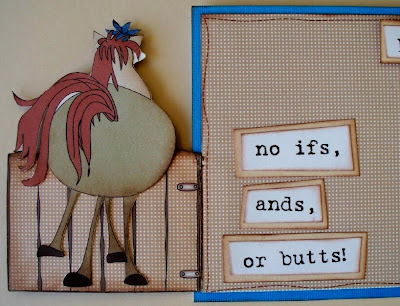 I think this would make fab invites! Dolly: I used the Mocha collection and stacking flower template to create a classic wedding card. Just love these flowers, easy to make but so effective. 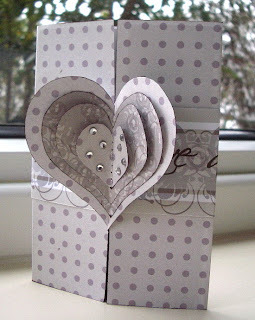 And a matching gift cardholder using the Interlocking Heart Template. 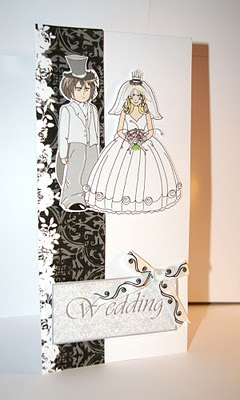 Nettie: I have used the Wedding Cake Box Template from the Love and Cherish CD, this CD is a must for your collection. I printed the template onto one of the Elegance patterns. To embellish I printed the stacking flowers onto some more of the patterned paper, then I topped off with some bling. So that's your lot for this week, an absolute treat, I think! We all hope we've inspired you, just leave us adirect link to your card in the comments or using Mr Linky below. Remember the closing date for entries is Sunday 24th Jan by lunchtime, and please make sure you take notice of the challenge rules. Introducing Our January Guest Designer!